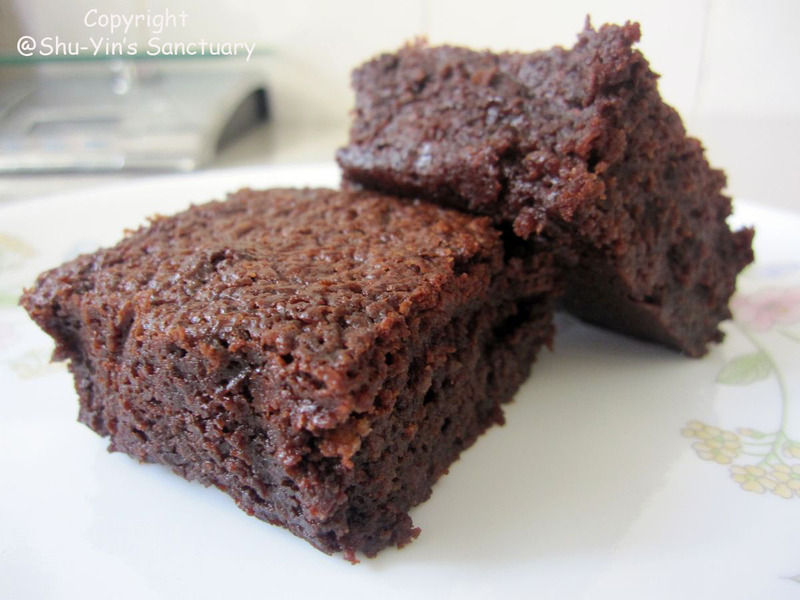 This is supposed to be the famed The Baked Brownie loved by Oprah and America's Test Kitchens. Wow...two big names loving it and this piqued my curiosity. Of course I want to have a try baking it too, especially since I love chocolates. Got the recipe from BrownEyedBaker's blog. The ingredient list calls for 11 oz of chocolates! A whopping 11 ounces! 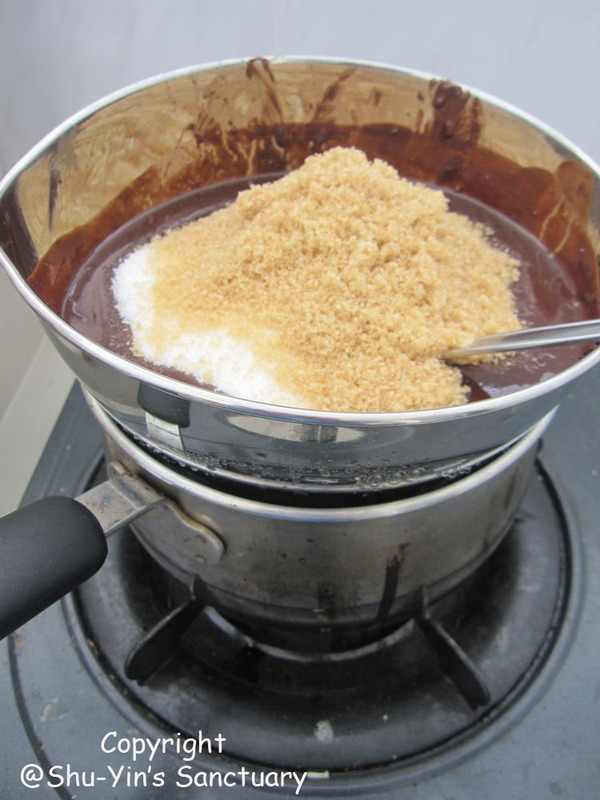 After melting the chocolate on a heat-proof bowl over a saucepan of simmering fire, sugars are added into it with the heat off. Then adding of eggs to the chocolate mixture. Lastly, the flour mixture is mixed into the chocolate mixture. 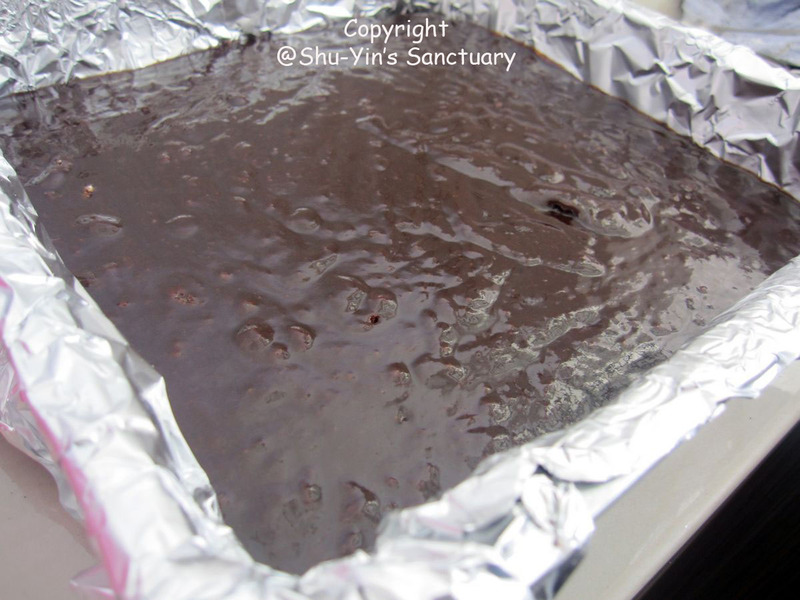 The batter is then poured into a baking pan covered with aluminum foil. 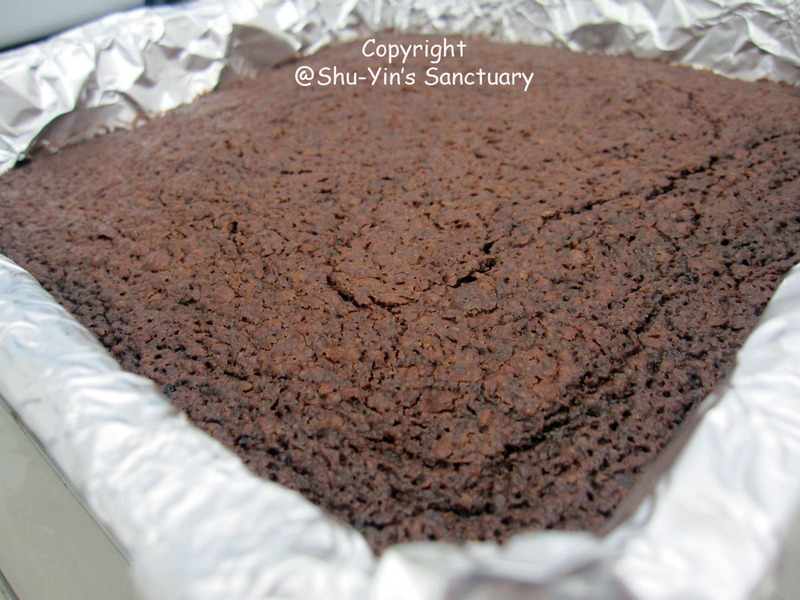 This brownie is not supposed to be cakey, therefore there is no calling for any leavening agents. Thus, no baking powder nor baking soda. 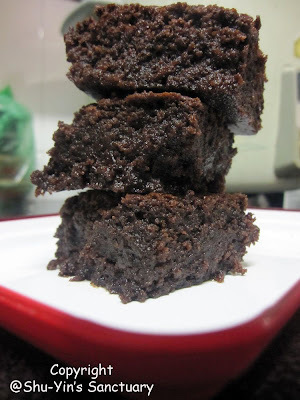 And also I like that some coffee powder is added into it, giving the brownie a nice chocolate-y coffee aroma. Surprisingly, the height is still there although no leavening agents is being used. 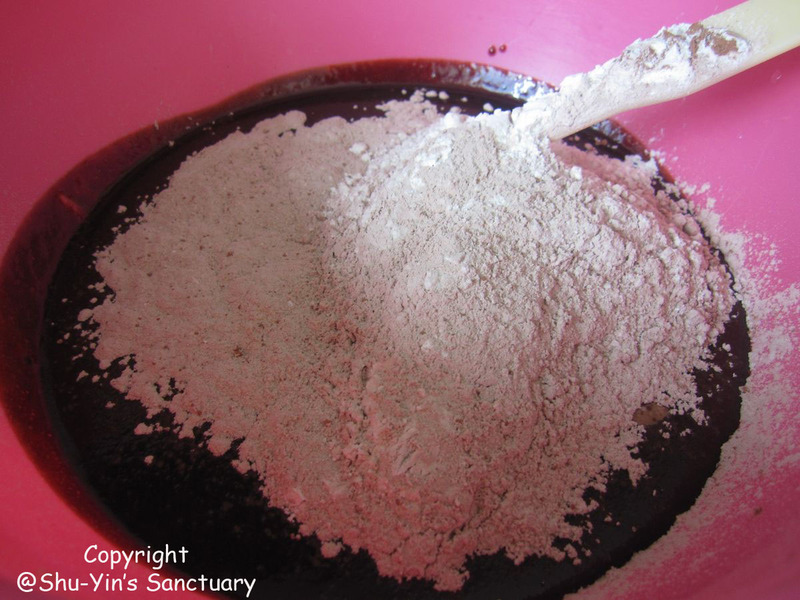 Maybe due to the large amount of chocolates used, plus additional flour and eggs which makes a bigger batter. I think there is no need to tell you that this is a dense and rich brownie. Not cakey, but dense and rich. 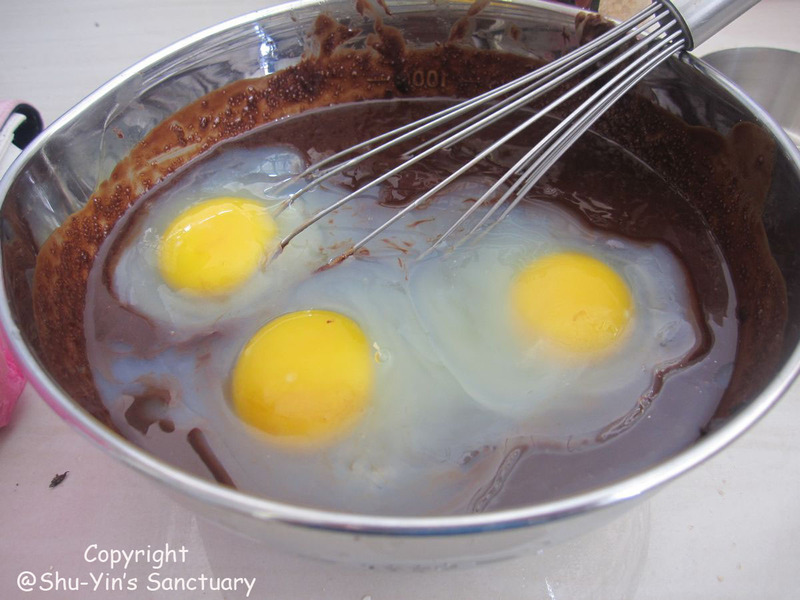 How could it not be when this recipe consists of 11 whopping oz of chocolates, cocoa powder and 5 eggs. All these spells RICH! Chocolate-y rich! Therefore this is definitely another brownie strictly for chocolate lovers! 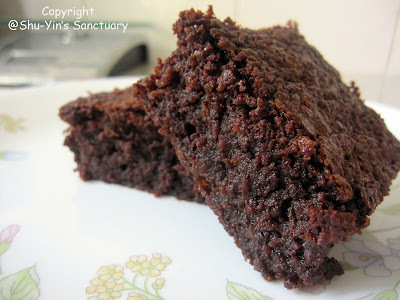 I think this brownie lived up to its fame. It is indeed delicious. It has a thin layer of crispy crust and the inside is moist and fudgy - the way I love it!